When you visit us, you can count on customer service that will make you feel like family. 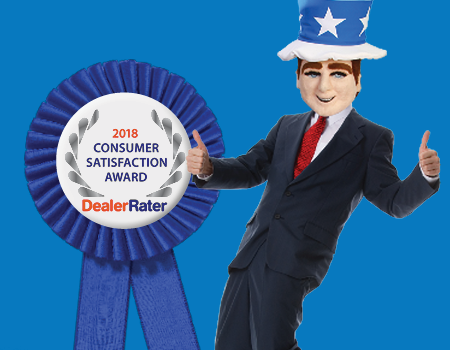 Take a look at these reviews of Frank Myers Auto Maxx to see how we’re faring! Customers leave happy and then return time and time again because of the exceptional service and attentive care received at our dealership. Don’t take our word for it. Before you come and see us, check out what other shoppers have had to say. You’ll find that our Winston-Salem used car dealership has approached all our visitors with compassion and attentiveness. After all, everybody has the right to ride, and we work hard to get you behind the wheel of a reasonably-priced car, truck, van, or SUV. How was your experience with our sales associates, our finance team, or our service experts? Let us know! We value feedback from everyone. It helps us improve and lets us know where our strengths are. With our stellar staff, we’re confident you’ll have a great shopping experience with us. Come see why so many people rave about us! Visit Frank Myers Auto Maxx today for your next new-to-you car or your next car repair. We’re eager to assist you! Dear Mr. Myers, I cannot say enough good things about Frank Myers Auto Max. I love my "09 Mitsubishi Galant. I always receive excellent service from a professional staff. I will only buy from Frank Myers from now on. Thank you so much for helping me achieve my dream of owning a certified, and reliable vehicle. Ask for Carl!!! My husband and I stopped by today and met Carl. He was so informative and most importantly HE LISTENED to what we wanted! You can tell he is honest person.Even though we didn't purchase a vehicle, the customer service he provided was 5 star! He was dressed nicely, smelled great and smiled a lot! He is super friendly! Give this man a raise! He is the example of excellence in customer care! The others there were nice too, not as engaging but Carl went above and beyond! He made sure our possible purchase was one to remember. Kudos to Carl! We will be back! My experience with Frank Myers was outstanding! They helped me get into a nice, reliable vehicle, regardless of my credit situation. Larry was my sales rep and he was also outstanding. He made sure to get me the best deal and worked with me as much as possible. Will recommend frank Myers to many people! We had such a great salesman Larry. He went up and above to find the right van for my family. I am very pleased with our new van. I would recommend Frank Myers Auto and Larry to anyone looking for a new car. Frank Mayers Auto Maxx of Patterson is the place to shop for your car. I have never purchased a car so fast in my life. Jessica called me on Tuesday evening around 5pm and by 7pm lwas already driving my new truck. Awesome experience they knew what I wanted, the price was right and Jessica was very professional and knowledgeable..
Larry helped me get in a new car with ease and made picking and financing a car that fit my needs super easy! Other staff, like Cassandra, stayed in communication with me and helped me get a car that suited my budget, specifications, and needs from start to finish. Awesome first car buying experience. I had an excellent experience at Frank Myers working with Chris. He’s very professional yet very down to earth. He worked quickly and efficiently, getting me into the car that I didn’t know that I wanted, for a price that I could afford. I’m beyond pleased with my purchase! I highly reccomend Frank Myers Auto and, while every one that works there is wonderful, I hope you can work with Chris! Highly recommend this dealship. The customer service was absolutely OUTSTANDING!! Our salesman Chris made us feel Welcomed and right at home from the start. He eased our apprehension and, concerns. He went above and, beyond to help us find just what we were looking for. I am still in awe of my experience and, I am so in love with my new car!! I would recommend this place to anyone looking to buy a new car. The atmosphere is great and the process is very simple. Larry was very informative and made the process stress free. I had a great experience today with Larry Rucker. He made my trade in experience such a smooth purchase. He gave me several choices based on my financial circumstance and helped me choose the best one. I would definitely advise anyone to him who is looking to buy a car.